The White House refuted reports Monday that Navy Rear Adm. Ronny L. Jackson, who withdrew his name to lead the Department of Veterans Affairs last week, will not return to his job as President Donald Trump's personal physician. 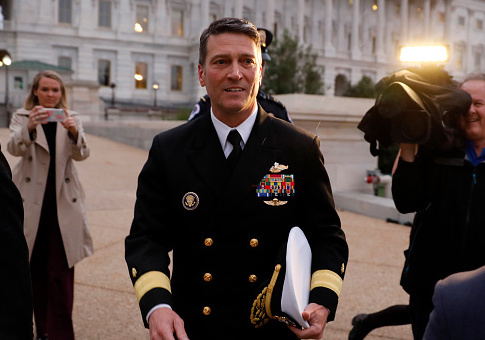 A White House official told reporters Sunday that Sean Conley, a Navy veteran who took over Jackson's responsibilities after his nomination, will remain as Trump's personal doctor, the Washington Post reports. The White House, however, responded Monday to say Jackson is currently "assigned to the White House as Deputy Assistant to the President" and "Despite published reports, there are no personnel announcements at this time." White House denies that Ronny Jackson is leaving as the president's physician: "Rear Admiral Ronny Jackson is currently on active duty, assigned to the White House as Deputy Assistant to the President. Despite published reports, there are no personnel announcements at this time." Jackson withdrew his name from consideration to be VA secretary after allegations of misconduct surfaced, including claims he created a hostile work environment and drank on the job. House Oversight Chairman Rep. Trey Gowdy (R., S.C.) said some of the allegations against Jackson should be investigated further by the Veterans' Affairs and House Oversight Committees. After Jackson withdrew his name, the White House released records disputing the allegations against him. The White House medical unit said Jackson, who also served at the White House while Barack Obama and George W. Bush were in office, successfully passed controlled substance audits. And despite a claim to the contrary, it also said he was not responsible for any government vehicle accidents. The Secret Service said it had no evidence of an alleged incident where they had to intervene so that Jackson wouldn't wake up Obama on a foreign trip. Jackson has denied the allegations against him, which have proved difficult to verify or disprove. Tester’s staff has yet to release documentation supporting the accusations, and a Secret Service statement on Friday said the agency had found no evidence to support one of the specific allegations. On Saturday, Trump called on Tester to resign. In a tweet, the president declared the allegations against Jackson "not true." "There were no such findings," Trump tweeted. "A horrible thing that we in D.C. must live with, just like phony Russian Collusion. Tester should lose race in Montana. Very dishonest and sick!" Trump also said last week that Tester would have a "big price to pay" for his treatment of Jackson. Update 10:12 AM: This piece was updated to reflect a response from the White House that Jackson is assigned to the White House as Deputy Assistant to the President and there are no current personnel announcements. This entry was posted in Politics and tagged Trey Gowdy, Veterans Affairs, White House. Bookmark the permalink.